Game is an addicting thing. Once you are too attached to it, you hardly find any other habit compensating for it. For gamers all over the world nothing excites them more than a quality game. A good example can be “Portal”. It is a valve creation. The game is a mind blasting game with terrific writing and great songs as background music. It challenges the players and develops their spatial imagination. The game is witty and its levels make you think in portals. You need to be at one with the portal technology to beat the game. It requires you to solve puzzles but it is a FPS game so it belongs to action genre of game. The Flash Version is every bit of good as its PC version is. The PC version has a short but intriguing gameplay. The characters are very well thought out and written. Those of you who played the PC version of the game will love the Flash adaptation. 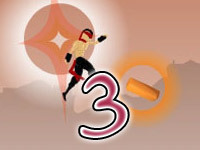 The game has 40+ levels where you need to transport your characters and objects to desired places for completing the levels. The PC game has an incredible storyline and unmatched scenarios. But Portal Flash Version is something which just carries on the excitement. It just kicks the addiction a bit further. I am sure you would love to see the characters and the 3D story and levels transformed in 2D right? Then this is the right place for you. The Flash adaptation of Portal just brings everything back in 2D. The original Portal lasted a little over 5 hours but the thrill it gave the gamers is still unmatched. It is not the case with the Flash adaptation. It has a number of levels to beat and it truly makes you think in terms of Portals. The Flash adaptation of Portal is a project of Ido Tal and Hen Mazolski. Truly it revisits the energy balls, crusher, blue and yellow portals in 2D. The same excitement remodeled into new package all together. The controls are easy too. You need to press A, W, D for movement, Q for firing a blue portal, E for yellow, R for closing two portals, F for picking an object up, ~ for opening console and O for adjusting the quality of the game. Just press Esc. to pause the game. Portal is an intriguing game on PC. Those of you who have not played the game, I’d insist you play the game to understand why I am saying so. People who played the original game, I am sure they want more of the portal technology. Here is Portal Flash Version to carry the excitement a little bit more. The game might not have the character details like the one built for PC or the intriguing storyline to go with it but it suffices by providing scopes for brainstorming and complexity levels. Imagine thinking of portals till you reach level 40. I am sure the flash version of the original Valve product will entertain you to the same extent. The best thing is this adaptation provides you the same experience with lot less consumption of your HDD space.